The location of Paschal Kennedy Motors is steeped in history and its unique structure and architecture, complete with horseshoe shaped entrance, is due to the fact that up until the turn of the century a forge was located there. In 1925 the premises officially became a garage when Irish Motors opened their doors there for the first time. During this time the late James J. Kennedy, father of the firm's current Managing Director, Paschal, had built up a formidable reputation as a highly skilled and talented engineer. 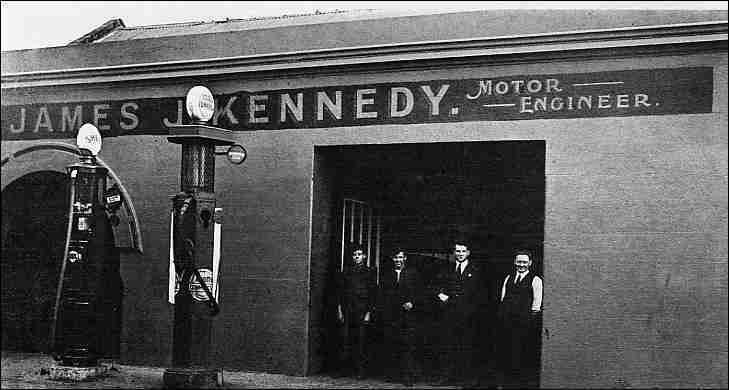 He then took the brave step and opened his own premises, James J. Kennedy Motor Engineer, in 1929 at the site of the current garage and this marked the beginning of a chapter in what was to become a hugely successful local family business. He became one of the first people in Dun Laoghaire to introduce body work, panel beating and painting into the garage environment. The outbreak of World War ll in 1939 resulted in a shortage of petrol and the motor industry suffered badly as a result. Following fourteen successful years in business, James Kennedy was forced to close his motor engineering premises. Paschal Kennedy followed in his father's footsteps from an early age and commenced employment as a qualified motor mechanic in 1948. By 1969 he had amassed great experience and expertise and on 6th April of that same year Paschal Kennedy took over the former site of his father's business to once more have the name of Kennedy adorn the premises. Paschal Kennedy Motors is still a family run business with Paschal's family David and Amanda together with his wife May carrying on the tradition and work ethos of James Kennedy to this day.